Before the season started we previewed the current New York Rangers squad. One of the biggest question marks for the season was, where will scoring come from? Two names came to the forefront as players that needed to step up in order for the Rangers to build on last season’s success as Eastern Conference champions. Veteran Rick Nash, a former two-time 40-goal scorer, was one of the players mentioned and the other was 23-year old Chris Kreider. Nash has done his part so far – entering play on Wednesday night, he led the NHL with eight goals. The speedy, aggressive Kreider showed flashes of brilliance over the 89 games he played in his first year-plus in the league, but his 37 points in 66 games last season was a disappointment. He finished 10th in the Rookie of the Year voting, a “mere” 1,100 votes behind the Calder Trophy winner, Colorado’s Nathan McKinnon. Expectations for this season are high for Kreider and so far #20 has come through. Tuesday night the Rangers met one of their arch rivals, the New Jersey Devils, for the first time this season. Down 3-1 on the road the Rangers rallied to tie the game in the third period, with Nash getting the goal that knotted things at three apiece. Kevin Klein wristed the game winner past Devils’ goalie Corey Schneider at 2:04 into overtime, But it was the play of Kreider that made things happen. The left winger picked up the puck behind his own net and skated it out of the defensive zone. He made a give and go pass with Chris Mueller as they crossed the red line and then charged towards the Devils’ net. He turned his back to Schneider and fed the puck on to Klein’s stick.. The defenseman, trailing on the play, beat Schneider with a swift shot for the game winner. It’s that type of play, a mixture of speed and strength that team President/GM Glen Sather was counting on when he selected Kreider with the 19th overall pick in the 2009 NHL entry draft. A product of Masconomet Regional High School and Phillips Academy, the Massachusetts native played three seasons at Boston College and was a member of the 2010 NCAA squad that beat Wisconsin for the national championship. Kreider found the back of the opponent’s net 49 times in 114 regular season collegiate games and finished his college career with just under a point (112 total) per game average. He also amassed 129 penalty minutes as part of the physical part of his game. Kreider added to his amateur resume with six goals in the 2010 World Junior championships won by the US. He added four more tallies when the US finished in third place a year later. With Kreider ready to go pro and the Rangers lacking scoring as they entered the playoffs, the team added the then-20-year old to their postseason roster. Though he was on the ice for just 51 minutes in the opening seven game series with Ottawa, Kreider scored his first NHL goal – the game winner – in a 3-2 victory in Game 6. With five one-goal games and two overtime games in the first round, coach John Tortorella increased Kreider’s play in the quarterfinal match with the Washington Capitals. The Rangers once again emerged victorious in a closely played, seven games series. Kreider played over 93 minutes, but was limited to a goal and an assist and was -4 for the series. His goal was another game winner (He became the first rookie to score back-to-back game winners in the postseason), in a 3-1 Game 1 triumph, but Kreider’s contribution on offense in the series was minimal. He had just nine shots on goal in a series that saw six games decided by one goal. If the first two series were considered tightly played, everyone knew the conference final against the New Jersey Devils was going to be even tighter. The Rangers led the best-of-seven series 2-1, but the Devils won three straight games to capture the series. Adam Henrique got the series game winner just 1:03 into overtime in Game 6. Again, Tortorella increased Kreider’s playing time in hopes of finding more scoring. Kreider, who had turned 21 during the Washington series, scored goals in each of the first three games, including a pair of power play goals. However, he and much of the rest of the squad couldn’t solve Martin Brodeur for the rest of the series. Kreider had a less than stellar 2012-2013 season with 12 goals in 48 games for the Connecticut Whale of the AHL and just two goals in 23 games for the Rangers, though much of the latter can be attributed to his assignment to the fourth line. The Rangers won another seven games series with Washington to open the playoffs, but were dominated by the Boston Bruins in the conference semis and were eliminated in five games. With his ice time limited, Kreider managed just a goal and an assist, though the goal was an overtime winner in Game 4 that kept the Rangers from being swept. A mundane 2013-2014 season was cut short by a hand injury that required surgery and caused Kreider to miss the first 10 games of the playoffs. Fans were beginning to wonder if Kreider was the real deal. Upon his return from the injured list, he registred five goals and eight assists in 15 games as the Rangers returned to the Stanley Cup finals for the first time in 20 years. The Rangers knocked off division rivals in the Philadelphia Flyers and Pittsburgh Penguins, and then topped the Montreal Canadiens in a conference final in which Kreider left his mark. Kreider’s impact in the series was both good and bad, and may influence how referees handle him this season. Specifically, the BC product’s collision with Montreal goalie Carey Price which caused the netminder to miss the remainder of the series. (The Rangers and Canadiens meet on Saturday for the first since the series.) 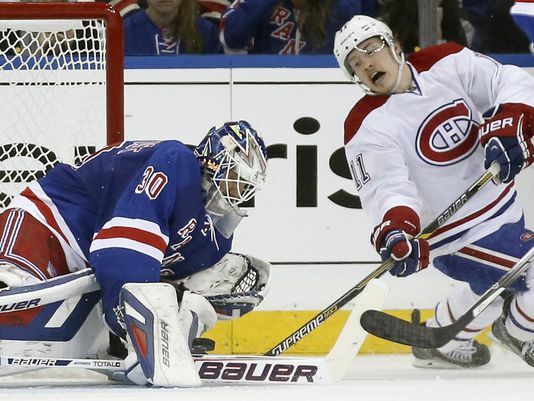 The Canadiens wanted Kreider suspended for the hit, but league officials did not agree. There seems to be a carry over in confidence and maturity from last season’s playoffs for Kreider. Through seven games this season, Kreider has a pair of goals, four assists, and is a +5. He’s also amassed 23 penalties, which may or may not be connected in some way to his crash with Price. The most important thing is that Kreider has been in the mix around the net and not afraid to continue his speedy, physical style of play. The Rangers will most certanly benefit from it. Don’t forget to follow us on Twitter and Facebook. Drew Sarver is the founder, publisher, managing editor, and a contributor for Designated For Assignment. He can be followed on twitter at @mypinstripes and @d4assignment or contacted by email at dsarver@d4assignment.com. For the NY Rangers to have success, Henrik Lundqvist must remain a world class goalie. The New York Rangers fanbase is one of the most loyal and most frustrated of any sports franchise’in history. Fans waited all or part of 54 years to watch the Rangers hoist the Stanley Cup after a drought that lasted from 1940 to 1994. When the playoffs arrive this Spring, it will have been 21 years since the Rangers won their last Cup, and their window of opportunity is running out. It’s remarkable to think back and realize that the Rangers really did not know what they had when they took Lundqvist in the 7th round of the 2000 entry draft. Al Montaya was thought to be the Rangers goalie of the future. In the year prior to his rookie season with New York, Lundqvist played for Frolunda HC Goteborg in the Sweden Elitserien League. (Now, the Swedish Hockey League.) He finished with a 33-8-2 record with a 1.79 Goals-Against-Average (GAA) in 44 games. (With the NHL season wiped out by a strike/players’ lockout, teammates included his twin brother Joel, Sami Salo, Daniel Alfredsson, and Loui Eriksson.) Lundqvist recorded a 1.05 GAA in the playoffs as Frolunda captured the league championship. By then the Rangers knew they had a head turning goalie. The Rangers made the playoffs in eight of Lundqvist’s nine seasons in the NHL, no small coincidence for a team that missed the playoffs for seven straight seasons before “The King” arrived in New York. In 2012, the Rangers lost to one of their chief rivals, the New Jersey Devils, in a six-game Eastern Conference finals. Last season the Rangers seemed dead in the water in the conference semi-finals, but rallied from a 3-1 deficit in games to defeat the Pittsburgh Penguins and then advanced to the Cup finals with a six-game defeat of the Montreal Canadiens. The Rangers lost the cup in five games to a faster, harder hitting, nastier, better scoring team in the Kings. LA also had the 2012 Cup MVP in goal, in the person of Jonathan Quick. The off-season apeared to severely damage the chances for a return to the Cup finals due to the free agent departure of defenseman Anton Stralman and forwards Brian Boyle and Benoit Pouliot. To supplant the losses, Rangers’ President and General Manager Glen Sather signed forwards Lee Stempniak, Ryan Malone and Tanner Glass, offensive-minded defenseman Dan Boyle, and defenseman Matt Hunwick. The Rangers will need to lean on their young core even more – Carl Hagelin, Chris Kreider, J.T. Miller, and rookies Anthony Duclair and Kevin Hayes. Wingers Martin St. Louis and Rick Nash must fill opponent’s nets with pucks like they did in Tampa Bay and Columbus, respectively. The Rangers ranked in the lower half (18th) in the league in scoring goals last season and were 15th on the power play. The latter is the main reason that Dan Boyle was brought in. The Rangers also need a breakout season from Kreider, whose speed, puck handling, strength and tenacity should produce more than the 17 goals and 37 points he scored in 66 games last season. But what will make the Rangers tick first and foremost is Lundqvist and their group of solid to stellar defenseman. Newly appointed team captain Ryan McDonagh, and fellow veterans (an assistant captains) Dan Girardi and Marc Staal need to stay healthy and productive, and be more aggressive on the power play. Lundqvist, who got his nickname from the Rangers’ fans was the recipient of two of Sweden’s most prestigous hockey awards, the Golden Helmet and the Golden Puck. Guldhjälmen (Golden Helmet) is the Swedish League’s MVP Award, which Lundqvist won for his extraordinary 2005 season. He also captured Guldpucken (Golden Puck) that same season as the league’s ice hockey player of the year. Goalie Cam Talbot made his NHL debut last season at 26-years of age. His timing was perfect; Lundqvist went through a stretch when he struggled and was actually benched in favor of Talbot. The rookie’s play was so good, some fans called for him to be the #1 goalie. Lundqvist returned to normal and those fans had their sanity restored. Talbot stuck with the team though and provided a solid and dependable backup goaltender. He recorded a 1.64 GAA in 21 games and finished with a 12-6-1 regular season record. Talbot will need to be sharp from the start of the current season with the first five games scheduled in eight nights. When the Rangers found out that center Derek Stepan would miss a minimum of 10 games with a broken leg, St. Louis volunteered to move from his usual wing spot to center. Coach Alain Vigneault agreed and St. Louis will be the top center on opening night against, you guessed it, the St. Louis Blues. Kreider and Nash will be his wingmen. Media pundits have wide ranging opinions as to the status of the Rangers this season, from not making the playoffs to finally capturing the Stanley Cup again (the NY Post’s Larry Brooks endeared himself to his readers with that prediction.) The Rangers certainly have the manpower on paper to return to the league finals, but they need scoring from their first three lines. They will need Stepan to not miss much more time than expected, for Matt Zuccarello to work his stick handling magic, for the power play to improve drastically, to remain one of the top penalty killing teams (third in the NHL last year at 85.3%), for Nash to remember how to score in the playoffs, and of course, for the King to be his outstanding himself. The Rangers get a break at the start of the season with 11 of the first 16 games scheduled at home. They need to take advantage of that situation and get off to a good start. Look for the Rangers to once again finish second in the Metropolitan division to Pittsburgh. Will they win the Cup? We’ll find out come Springtime. It’s a bird. It’s a plane. It’s……Ezequiel Carrera. 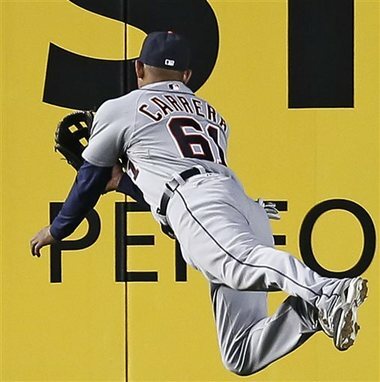 The New York Yankees beat the Detroit Tigers 2-1 in the opener of a four-game series at Yankee Stadium Monday night, but it could have been an early blowout if not for Carrera. With the bases loaded and no one out in the bottom of the 1st inning, the Yankees’ Jacoby Ellsbury hit a drive to deep centerfield. Carrera, playing shallow, raced back and took off like the caped Kryptonian…or at least, Jim Edmonds. The centerfielder snared the baseball and held on as he came in for a heavy landing. What could have been a three-run triple, possibly even an inside-the-park grand slam, turned into a sacrifice fly. The Yankees eventually got a second run in the inning before second baseman Ian Kisler robbed Chase Headley of another run and ended the frame. Kings’ captain Dustin Brown’s Game 2 winner put the Kings halfway to another Cup. Watching the relentless style of the Los Angeles Kings makes you wonder why the Kings aren’t going for a three-peat of the Stanley Cup rather than their second title in three years. The Kings have taken the first two games from the New York Rangers in overtime and double overtime. Both games played on the left coast saw Los Angeles come back from two goal deficits to force the extra ice time. They’re the first team to come back from two goal deficits to win in three straight games. The first was the finale of the Western Conference Finals when they topped the Chicago Blackhawks. While the Rangers tremendous speed has been their biggest asset in the series, the big-bodied Kings hit from beginning to end. And they just keep coming. Saturday night the Rangers were hoping to bounce back from their Game 1 disappointment and it appeared they might just do that. Game 2 started out in much the same manner as Game 1 with the Rangers netting the first two goals. But things turned around in the third period with New York ahead 4-2. The Kings’ controversial third goal will be talked about for some time to come, but the aftermath was more frustrating for fans who saw the Rangers lose control of the game. It started when the Kings’ Matt Greene shot the puck from the right point. Kings’ winger Dwight King was a sandwich between goalie Henrik Lundqvist and defenseman Ryan McDonagh in the Rangers crease. Greene’s shot hit King and got past Lundqvist for the goal. A two-goal lead was suddenly one and the shift in momentum was palpable. Lundqvist immediately expressed his frustration to referee Brian O’Halloran, who signaled good goal. O’Halloran’s two part explanation was the puck was already past Lundqvist when contact was made and the contact was initiated by McDonagh.1 There is currently no video review for goaltender interference, but that could change as a result of the impact of the Kings’ goal. It was an odd no-call considering the Rangers Benoit Pouliot had gotten called for goaltender interference earlier in the game on a play that had less contact with the puck nowhere in sight. The goal came within the first two minutes of third period and fired up the Kings’ fan base. Just as they had in the first game and throughout this year’s playoffs, the Kings took advantage of their opportunities. Former Ranger Marian Gaborik swept a loose puck in the slot past Lundqvist to tie the game at four apiece with a little over 12 minutes remaining in regulation. After a scoreless first overtime – kept that way when Kings’ goalie Jonathan Quick stopped the Rangers’ Chris Kreider on a breakaway – Dustin Brown redirected Willie Mitchell’s blast from the left point past Lundqvist for the game winner at 10:26 of the second extra session. Just like that the Kings are in command of the best of seven series. Many in the media predicted the Kings would be tired entering the series after having gone the full seven games in their three previous series. The Western Conference semi-finals concluded with a Game 7 overtime. While the Kings may be tired, they don’t look tired. In fact, it’s the Rangers who appear to be more tired. The Rangers, particularly in Game 2, often fell to the ice without contact. Bad skates or tired legs? Only five teams in the history of the Stanley Cup playoffs have come back from a 2-0 deficit to win the championship. The 2011 Boston Bruins and 2009 Pittsburgh Penguins rallied from two down to win the title. They’re the only teams to do so in the last 40 years. Rangers defenseman John Moore returned from a two game suspension for elbowing Montreal’s Dale Weise in the Eastern Conference semi-finals. Defenseman Rafael Diaz was a healthy scratch. Dan Carcillo’s 10 game suspension, for abusing an official, was reduced to six games and he could return for the fourth game of the series. The Stanley Cup champion. There can be only one! When you think about Los Angeles sports teams, physical toughness isn’t usually what comes to mind. The Magic Johnson-led Lakers couldn’t handle the Larry Bird-led Celtics until the Lakers upped their physical game. The result was two more championships in 1985 and 1987. 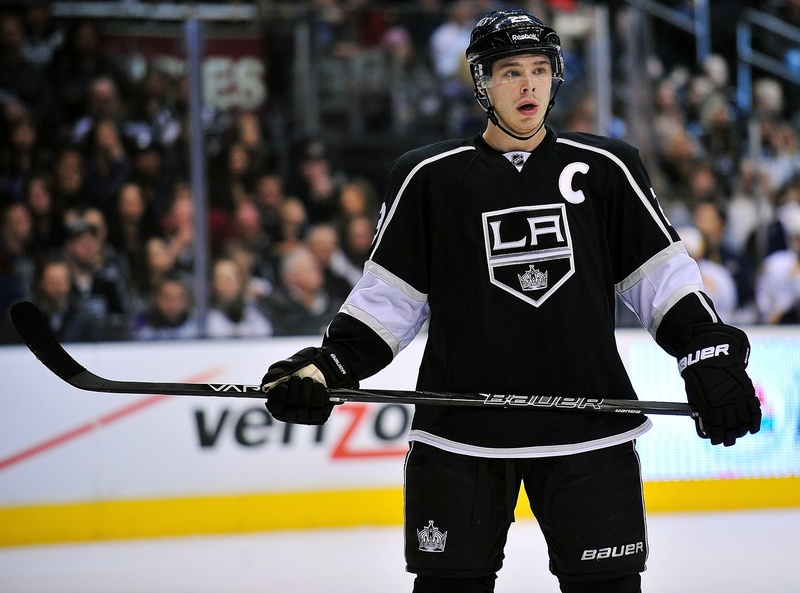 The LA Kings epitomize toughness and physicality. On the other hand, when you think about New York City sports teams, physical and mental toughness is one of the first things that come to mind. Whether it’s rebounding from 9/11 or Hurricane Sandy, New Yorkers and the residents of the Tri-State area are made of tough stuff. Against this backdrop of steely stoicism, you don’t necessarily think about people being in touch with their emotional side. Yet the New York Rangers are fine representation for family and watching each other’s backs. The two biggest markets in sports are ready to clash in what could be an epic Stanley Cup Final. Major League Baseball saw the two cities duke it out four times, but the last World Series final between the Yankees and Dodgers was 1981. The Knicks and Lakers met in classic NBA finals in 1970, ‘72, and ‘73. The east and west coast powers have not met in football, which now stands as the only one of the four major sports where that is the case. Beginning tonight, the Kings and Rangers will maneuver, coach, hit, shoot and pass the puck and kick- and glove-save it away for up to two weeks. 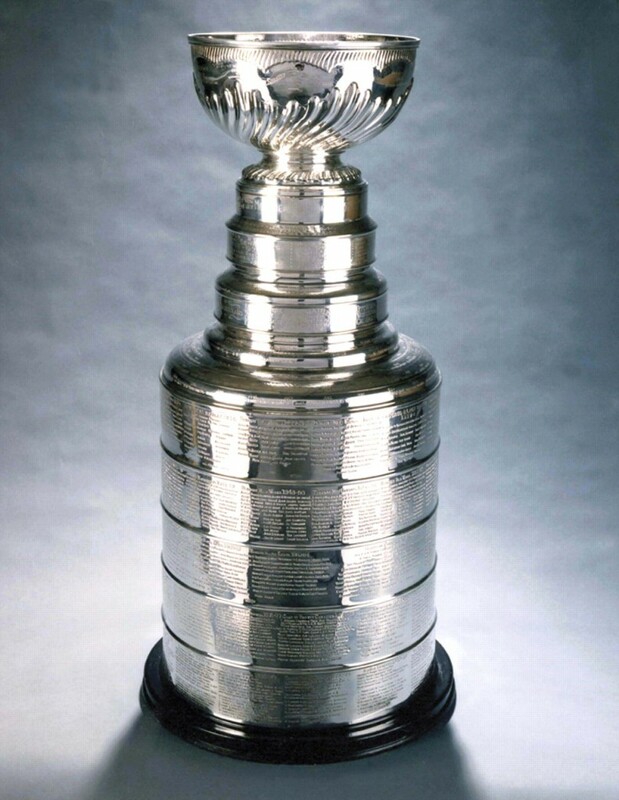 When one team reaches that magical fourth victory in the best-of-seven series, the Stanley Cup will be wheeled out by white-glove clad men for the greatest celebration in modern sports. Don’t let the words of Los Angeles Kings head coach Darryl Sutter fool you. He’s trying to play the underdog. But his team, which is largely intact from when they won the Stanley Cup two years ago, is the clear favorite. After playing three conference series, the last of which ended in a Game 7 overtime victory on Sunday night, will the Kings show any fatigue? In Game 1 of the Stanley Cup, that’s not happening, at least from the outset when adrenaline takes over. The third period will be the true indicator of whether there is any lag from the Western conference finals. The Kings are a beast that you better finish off when you have the chance. Their first round series with the San Jose Sharks saw the Kings fall behind three games to none. Four straight wins followed, including a 5-1 wipeout in Game 7. The Anaheim Ducks looked like they would be the ones to knock the Kings off their throne when they erased a 2-0 deficit in games and won three straight. Forget about it…the Kings forced a Game 7 with a 2-1 victory at home and then dominated another seventh game on the road, 6-2. Though not necessarily well played at times, the conference finals between the Kings and the defending champion Chicago Blackhawks was a classic. This time it was the Kings blowing a lead when the series appeared to be over. Back-to-back victories were earned by Chicago in Games 5, which went to double overtime, and in Game 6 which forced yet another seventh road game for LA. In their 21st playoff game of the year, the Kings’ Alec Martinez got a fortuitous bounce off of Blackhawks’ defenseman Nick Leddy, and the puck sailed past goalie Corey Crawford for the game winner. No one expected the Rangers to reach the Stanley Cup final this year. There was no reason to expect it with the inconsistency that plagued the regular season or the powerless power play or their inability to score goals. Then the trade deadline came and GM Glen Sather had a tough decision to make. Should he hold on to free-agent-to-be captain and spiritual leader, Ryan Callahan, or deal him so as not to lose out on any return if he walked after the season? Martin St. Louis was doing his own deliberating down in Tampa Bay. The 13-year veteran, possibly prompted by the decision of Lightning GM and Team Canada Executive Director Steve Yzerman to pass over his selection for the 2014 Canadian Olympic team, demanded a trade. He had one destination in mind, the New York Rangers, which would put him near his home in Connecticut. On March 5, the Rangers sent Callahan, a first round draft pick, and a conditional first round pick to the Lightning for St. Louis and a pair of conditional picks. St. Louis managed just one goal and eight points in 19 games, and many wondered aloud if the 38-year old could handle playing in New York. But his teammates, especially friend and former Lightning teammate Brad Richards, knew better. The playoffs began and St. Louis started clicking. The Rangers battled division rival Philadelphia before they squeaked out a 2-1 win in Game 7 at home. When they fell behind the Pittsburgh Penguins three games to one in the conference semi-finals, most pundits and fans started making their offseason plans. Then a tragic event seemed to turn things around. St. Louis’ mother, France, died unexpectedly at the age of 63. St. Louis and his family were embraced by the Rangers and a close team became even closer. The team, sparked by the play of St. Louis and goalie Henrik Lundqvist, won three straight games to capture the series. 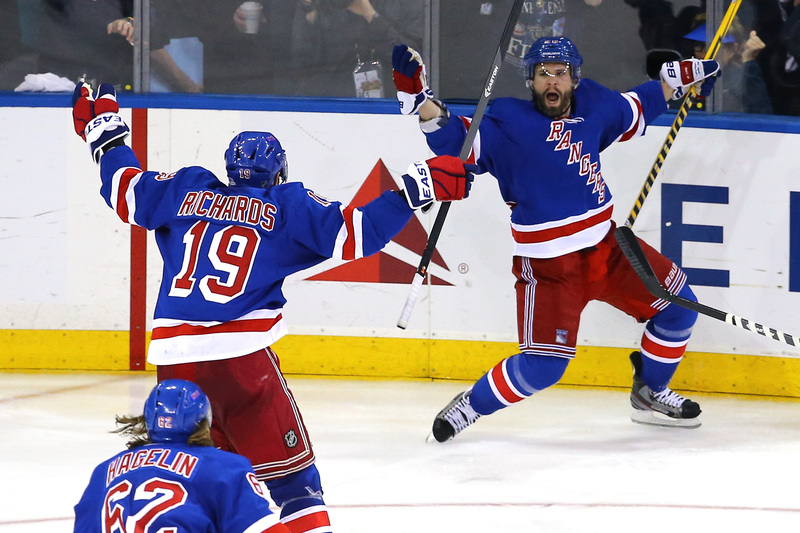 Like the Kings, the Rangers had won Game 7 on the road. The specialty units, especially the power play, had improved dramatically. 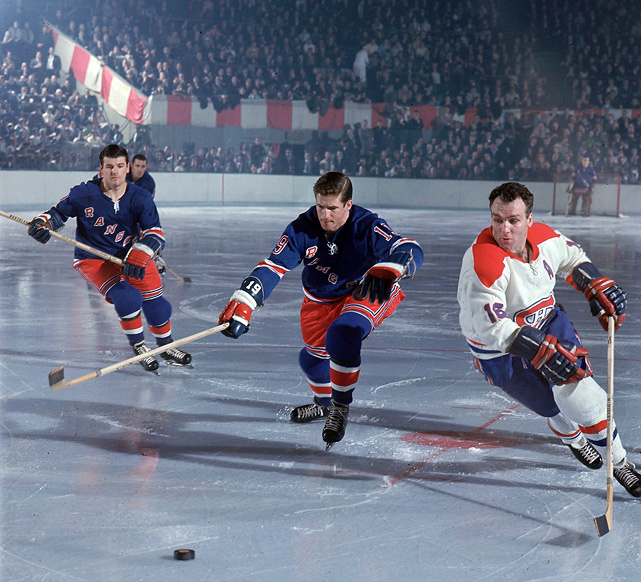 In the conference finals, the Rangers faced off against long-time “Original Six” rival, the Montreal Canadiens. 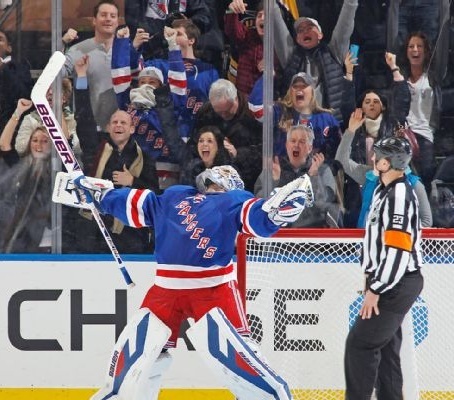 The played their best game of the postseason in the Game 6 clincher, which saw Lundqvist and the Rangers win 1-0. Head man Darryl Sutter is part of hockey royalty. Along with his brothers Duane, Brent, Brian, Ron, and Rich, he played in the NHL, and Brent’s son Brandon is currently a member of the Pittsburgh Penguins. Prior to coming to LA, Sutter coached the Chicago Blackhawks, San Jose Sharks and Calgary Flames. He was behind the bench for the Flames team that went to the seventh game of the Stanley Cup finals with the Tampa Lightning in 2004. The Lightning, which included St. Louis and Richards, won the finale 2-1. Sutter was also GM of the Flames and resigned as coach after the 2005-2006 season to concentrate on his front office position. He stepped down in the middle of the 2010-2011 season and was hired a little less than a year later to replace Terry Murray as the Kings’ head coach. Sutter then won his first Stanley Cup when the Kings swept the New Jersey Devils in the 2012 final. Alain Vigneault knows what it is like to get to the mountain top, but also how rough it is to come back down. The former defenseman played just 42 games over parts of two seasons in the NHL before going into coaching. After not finding success in parts of four seasons with Montreal, Vigneault was hired as the Vancouver Canucks’ head man in 2006-2007. The Canucks finished with the best record in the division and/or NHL six times in the regular season, but made it to the finals just once. There they lost to the Boston Bruins in seven games after holding a 3 games to 2 lead. After being swept in the first round last year, the Canucks fired Vigneault, who basically swapped jobs with fellow fired coach John Tortorella. The Kings’ Drew Doughty is arguably one of the best defensemen in hockey. He was the second overall pick in the 2008 NHL entry draft, following high-scorer Steven Stamkos. The Ontario native has scored 10 or more goals four times in his six-year career and is smooth as glass when handling the puck. He finished third in the Norris Trophy voting, for best defenseman, in 2012 when he collected a career-high 59 points. He added 16 points, including a tournament-high 12 assists, as the Kings won the Cup. The Rangers need to be aware of Doughty’s tendency to pinch into the offensive zone. The durable 24-year old averaged better than 25 minutes of ice time per game during the regular season and upped that by two minutes in the playoffs. The Rangers’ Ryan McDonagh was the 12th overall pick by the Montreal Canadiens in the 2007 draft. That same year, the Rangers signed free agent center Scott Gomez to an awful seven-year, $51MM contract. After two mediocre seasons in the Big Apple, the Rangers were desperate to trade Gomez and the Canadiens were desperate for a top center. Gomez and Tom Pyatt headed to Montreal for three players, including McDonagh. Whether he knew what he had at the time or not, it turned out to be one of the best deals that Sather ever made. The soon-to-be 25-year old defenseman stepped up his offense this season and set career highs with 14 goals and 43 points, but it’s his transition from offense to defense and stopping shooters in the defensive zone that makes McDonagh special. Marian Gaborik knows what it’s like to wear the red, white, and blue of the New York Rangers. He did so for three-plus seasons and scored 41 goals for NY two years ago. But his style of play was stifled under former head coach John Tortorella’s “defense first” approach, and he was sent packing to Columbus for three current Rangers – Derick Brassard, John Moore, and Derek Dorsett. Gaborik missed half of this season due to injury and was dealt to the Kings at the trade deadline in March for two draft picks. Gaborik is now healthy again and has topped all playoff scorers with 12 goals, 10 of them at even strength. Many of “Gabby’s” goals come from his ability to elude defensemen around the net. The Rangers’ Rick Nash was acquired from Columbus prior to the 2012-2013 season for three players and a first round pick. The hope was that he could combine with Gaborik to give the Rangers a pair of solid scoring lines. A player’s strike/owner’s lockout didn’t help, but the experiment failed and the Rangers parted company with Gaborik. Nash was solid in his first year in New York with 21 goals and 42 points in 44 games. A concussion had a major impact on Nash earlier this year and he finished with just 39 points in 65 games. He also lacked playoff experience and postseason success, and the Rangers’ fans let him have it when he went without a goal in the first two rounds this year. Nash finally got his offense going in the conference finals with three goals and a pair of assists. Just as importantly, he’s been responsible in his own zone and has played a physical game. The Kings have an experienced, playoff-tested squad that has just about seen and done it all this year. They find ways to win, not ways to lose. For that reason, the prediction here is the Kings in six. It’s been well documented by now that St. Louis’ mother passed away prior to Game 5 of the conference semifinals with he Pittsburgh Penguins. From that moment on, St. Louis seemingly elevated his game as his teammates embraced him and his family as if France St. Louis was related to all of them. After a Game 5 victory in Pittsburgh, the Rangers returned home to try to even the series with the Penguins. St. Louis was accompanied by his grieving father and sister. The Rangers’ diminutive winger with a big heart scored the game’s first goal and in doing so, ignited the Madison Square Garden crowd. The Rangers won 3-1 and St. Louis was named first star of the game. The Rangers edged the Pens 2-1 in the finale, with St. Louis assisting on good friend Brad Richard’s go ahead goal. Acquired at the trade deadline for popular captain, Ryan Callahan, St. Louis has had six points (three goals and three assists) in the last five playoff games. His six goals this postseason is the sixth best among all players. Sunday night’s Game 4 was crucial for both teams in the series. The game was rough, rugged, and chippy after the thrown elbows and shoved linesman of Game 3. Montreal’s P.K. Subban scored a third period power play goal that erased a 2-1 Rangers’ lead. Then Galchenyuk found himself alone at the side of the left circle and came that close to erasing the series lead with the shot heard ’round the Garden. Six minutes into overtime, Richards dug the puck out of the boards and flipped it Carl Hagelin. The Swedish-born winger found St. Louis all alone in the right circle. The shot made by St. Louis could only be made by a player with his type of elite offensive skills. He got the puck on the tape of his stick blade, skated through the right circle and put the puck between the narrow opening above Tokarski’s left shoulder and the crossbar. Most of us have gone through what St. Louis and his family are in the midst of weathering. From personal experience, I know how difficult it is to balance the loss of a parent and going to work every day – ; trying to keep your life as balanced and normal as possible. I can’t imagine what it’s like to do that in front a packed, frenzied arena. It makes St. Louis’ play all the more remarkable. Montreal goalie Carey Price skated for the second day in a row on Tuesday and was in full uniform. But coach Michel Therrien insisted Price would not be available in the conference finals. Rangers center Derek Stepan skated with his squad and could return Tuesday for Game 5. Former teammate Brandon Prust caught Stepan with an elbow in Game 4, breaking the Rangers’ jaw. Prust received a two game suspension for the hit. The two teams in the National Hockey League’s Eastern Conference finals got there in different ways, but the pair have a lot in common. The Montreal Canadiens and the New York Rangers are two of the “Original Six” NHL squads and both have been chasing the Stanley Cup for decades. The resumes of two of the oldest franchises, however, are quite a bit different. With the best players coming from Canada and a territorial draft in place for years, the Canadiens fielded teams chock full of future Hall of Fame members. Those teams rang up a league record 24 Cups, though the Habs have not won one since 1993. The team they will oppose, the New York Rangers, haven’t won the Cup or reached the league finals since 1994. The Rangers have won just four championships in their 88 seasons and had a 40-year gap between Cups three and four. Whichever team emerges as the conference winner, they won’t have an easy time in the league finals. Either the Los Angeles Kings, the 2012 Cup winners, or the Chicago Blackhawks, the defending NHL champs and the champions in 2010 as well, will meet them in the last best- of-seven series. Both the Canadiens and Rangers made it to the conference finals with big performances on the road and after some of the media and their own fans had written them off. Montreal was down 3 games to 2 to Boston, went home and shut out the Bruins out in Game 6, 4-0. The seventh and decisive game was back in Massachusetts at the TD Bank Garden. Montreal quickly took the crowd out of play with a goal by Dale Weise just 2:18 into the game. The Canadiens clung to a 2-1 lead late in the third period when forward Daniel Briere’s pass hit the skate of Bruins’ captain Zdeno Chara and deflected past goalie Tuukka Rask for the clincher with just under three minutes to play. The Canadiens had advanced to the conference semi-finals with a first-round sweep of the Tampa Bay Lightning. The outcome was made possible with wins on the road in Games 1 and 2. The Rangers had to go the distance to knock off the Philadelphia Flyers in their first-round match up. Then they had to do it again against the Pittsburgh Penguins to set up a series of NHL “oldies”. The Rangers played their worst game of the playoffs, on home ice, in Game 4 to go down 3 games to 1 to the Penguins. The Madison Square Garden throng booed their team right off the ice. Then a funny thing happened on the way to the forum, or now, the Belle Centre. Something tragic happened as well. The mother of Rangers forward Martin St. Louis died of a heart attack the night prior to Game 5. A shocked team rallied around their teammate and St. Louis played with a renewed passion and fire. The Rangers also got a boost from the return of injured youngster, Chris Kreider. It was Kreider’s power play goal that ignited a 5-1 win and sent the series back to New York. With his father and sister in attendance, St. Louis scored 3:34 into the first period of Game 6 to give the Rangers the lead for good. An already raucous Garden crowd amped up the volume from there. The Rangers went on to a 3-1 win with Henrik Lundqvist stopping 36 shots. The finale in Pittsburgh was a fight to the finish. Brad Richards’ power play goal snapped a 1-1 tie in the second period and then it was all Lundqvist. The 2014 Olympic silver medalist stopped a full-out assault in the waning minutes of regulation play and stopped 35 shots overall. So now, the two teams will lace up the skates and “put on the foil” for a 1 p.m. Saturday face-off. The Rangers need to put aside their past, which in this case is an incredible number of losses (65-200-40-3) in Montreal, be it the old Montreal Forum or the Belle Centre. The Canadiens need to continue to play with a chip on their shoulder. Defenseman P.K. Subban has been chief among the Canadien players in saying the team hasn’t been shown any respect. Who he is referring to specifically is anyone’s guess. The Goalies – Price beat Lundqvist in the Olympic finals this year, and was a major factor in the Canadiens’ defeat of the Bruins. Price doesn’t get the publicity that New York media darling Lundqvist does, but he’s a star goaltender. Lundqvist was red hot for the final three games of the Penguins series and needs to remain that way. He was the Vezina Trophy winner two years ago and a finalist last season. Slump Busters – Rick Nash was booed by his own fans, especially in the Game 4 fiasco. “Nashty” has 289 career goals, but the soon-to-be 30-year old has failed to light the lamp in 14 playoff games this year. In fact, he only has two career goals and 11 points in 30 post-season games between the Rangers and Columbus Blue Jackets. While he has still been a physical presence on the ice, the Rangers need him to put pucks in the back of the net to have a chance to advance. Briere is not the player he used to be. He has just two goals in 11 playoff games this year and one of those was the aforementioned deflected pass. Two years ago, as a member of the Flyers, Briere had eight goals and 13 points in 11 games. At 36, perhaps his skills have diminished around the net. He’ll have to prove otherwise. The Defense – Subban has been superb on both ends of the ice. Last season’s Norris Trophy winner, for the best blueliner, put up 53 points in the regular season. He also leads the Canadiens in postseason scoring this year with 12 points. Subban’s the quarterback of the Habs’ power play and makes an easy transition with the puck from defense to offense. He’s also a physical player (81 penalty minutes this year) and a vocal leader. He’s the one publicly spurring the team on as the under-appreciated underdog. The Rangers’ best two-way defenseman, Ryan McDonagh, looked horrible for the first four games of the Penguins’ series. Perhaps he was still hurting from a late-season shoulder injury. Whatever the case, the “old” McDonagh seemed to be back for the final three games of the series. By his own admission, he’s played a more defensive role this postseason than he did during the regular season. But the Rangers will need him to pinch into the offensive zone more often to add some scoring punch. Daniel Girardi, who was awarded a six-year, $33MM contract earlier this year, needs to find his game. He’s been terrible in the defensive zone and it’s cost the Rangers on the scoreboard. He and Marc Stahl are the number one defensive pairing for the Rangers, but Girardi needs to step up his game for that to truly be the case. Despite their lack of success in Montreal – including a Stanley Cup finals loss in 1979 – the Rangers should come out on top in the series, though it will take another seven games. The Rangers’ power play must be as successful as it was at the end of the Penguins series and not as poor as it was at the start. Price is great, but Lundqvist’s play at the moment trumps him.